The first thing to say about Keno is that’s a certainly not a serious way to make any money; use it as a brief diversion when you can’t decide which online slot to play. Keno is a game faintly related to Bingo in that it involves the drawing of numbers which are then matched against those on your game card. Make enough matches and you become a winner. 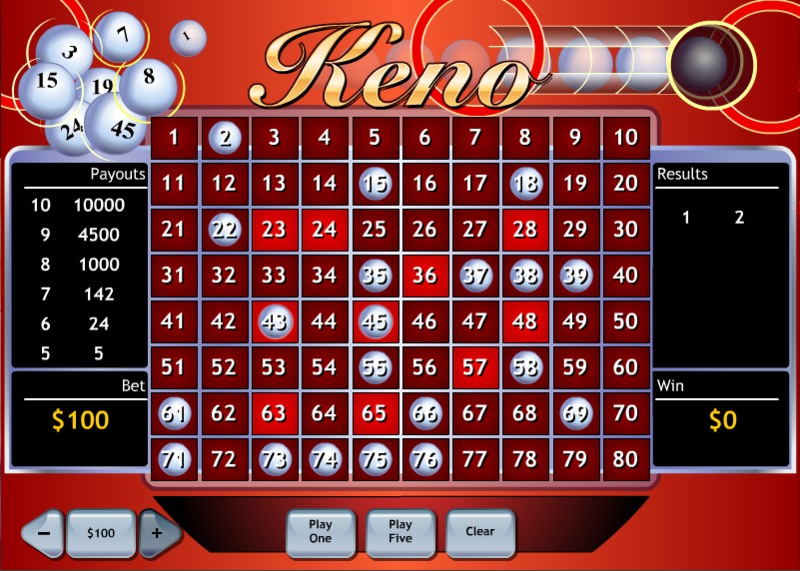 This version of Keno is by Playtech and it’s definitely can’t be described as a state of the art example of the genre. Graphical quality doesn’t really matter though when playing this game because it’s all about the balls and the game card. Load up this game and you will see that it all looks very simple; the game card contingent 1 – 80 numbers is in the centre of the screen, the payouts are shown to the left and the results of recent games are to the right. The first thing to do is select you stake size between £0.10 and £100 using the ‘+’ and ‘-‘ buttons in the bottom left hand corner. You can now choose to select between 2 and 20 numbers on the game card. Choosing two numbers and getting one match returns the lowest odds of 1/1 while choosing and matching all ten returns 10000/1. Once you’ve chosen your numbers, you can choose to play one game or five games in a row with the ‘Play One’ or ‘Play Five’ options below the game card. The machine now takes over and draws 20 balls at random numbered between 1 and 80. This is where you watch in hope that they will land on the numbers picked by you. When the draw has finished any wins will be paid and you can start again’ just click the ‘Clear’ button and have another go. There’s nothing much wrong with this version but it is a little dated now and doesn’t compare well with rivals such as Net Entertainment’s Keno which offer a better RTP and more features. This version offers an RTP of between 92.09 (2 numbers chosen) to 92.55% (10 number chosen).